OTTAWA, Nov. 8, 2016 /CNW/ - Northern Shield Resources Inc. ("Northern Shield" or the "Company") (TSXV: NRN) is pleased to provide results from the drilling program at Huckleberry. The Huckleberry program was executed under the terms of the Option Agreement with South32, announced on June 7, 2016. Seven drill-holes, totaling 2,053 metres were completed. Drill-holes 16HK-01, -06, and -07 targeted the peridotite/olivine melagabbronorite unit which hosts the main mineralization in the Western Zone; 16HK-02 targeted the western contact of the Huckleberry Intrusion; 16HK-03 and -04 targeted VTEM anomalies in the Eastern Zone and drill-hole 16HK-05 targeted the central portion of the Huckleberry Intrusion. Drill-hole 16HK-03 was abandoned after 100 metres due to technical difficulties. All but one of the seven drill-holes intersected disseminated magmatic copper-(nickel-PGE) mineralization with twenty-nine samples assaying greater than 0.3% Cu in association with Ni and PGEs. Select samples are shown in Table 1. Importantly, drill-holes 16HK-01, -06 and -07 all intersected the mineralized peridotite unit interlayered with a glomeroporphyritic gabbronorite (GPG). The mineralization in a sequence of interlayered peridotite and GPG is seen to thicken northward and down-dip from 9 metres in 16HK-01 to 52 metres in 16HK-07, including the interval reported in Table 1. The increase in sulphide content along with other geological features provides a vector to potentially massive sulphide mineralization down-dip and north of this hole. The similarity in geology and associated mineralization of the drill-holes along the Western Zone suggests that the mineralization is continuous for approximately 2 kilometres and still open to the north of 16HK-07, south of 16HK-01, and down-dip to the east. 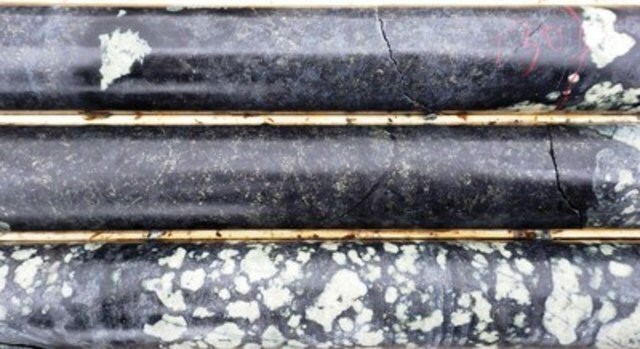 Mineralization in drill-holes 16HK-03 and -04 along the Eastern Zone occurs in a xenocrystic gabbronorite with disseminated blebs of pyrrhotite and chalcopyrite over a few metres. Both holes 16HK-03 and -04 have on average 0.36% Cu and 0.1% Ni over 4.0 (61.2 to 65.2 metres) and 4.64 metres (329.66 to 334.31), respectively. The geological sequence and mineralization is very similar in both holes which are 2.4 kilometres apart. The sedimentary units located below, above and within the Huckleberry Intrusion, consist of argillites, sandstones, and mudstones. Some of the sedimentary intervals are conductive due to the presence of graphitic argillites, pyrite, and pyrrhotite banding. Chlorite and silica alteration was present within various sedimentary intervals. Several quartz-carbonate-chlorite veins and fractures also contained chalcopyrite. Disseminated copper and zinc was noted in nearly all sedimentary units and within the intrusion near the contact. Although the complexity and sulphidic nature of some of the sedimentary rocks present challenges for airborne EM depth penetration and interpretation, they are an excellent sulphur and contaminant source for the formation of Ni-Cu-PGE massive sulphides in the Huckleberry Intrusion. Northern Shield President & CEO Ian Bliss commented, "The intersection of modest to significant mineralization in all but one drill-hole, highlights the extensive nature of the mineralization at Huckleberry. These first holes were always planned as 'scout' holes, and the assay results, geochemical ratios and core observation provide distinct and encouraging vector information with follow up drilling and ground geophysics being planned for next season." Preparations for a drill program at Séquoi later this month are underway. An update on this program and highlights from a pilot-scale till and boulder sampling program will follow shortly. Table 1. Select assays from the Huckleberry Project. The program at Huckleberry was overseen by Christine Vaillancourt, P. Geo., and a Qualified Person under National Instrument 43-101. Samples were analyzed by ALS Global in Sudbury, Ontario and in Vancouver, BC, for Au, Pt and Pd by Fire Assay with ICP-AES finish and base metals by four acid digestion and ICP-AES. Northern Shield Resources Inc. is a Canadian-based company focused on exploring for platinum group element ("PGE") and nickel-copper-PGE deposits. It is known as a leader in grass roots exploration for Ni-Cu-PGEs and the understanding of magmatic systems as it applies to exploration. This news release contains statements concerning the exploration plans, results and potential Cu-Ni-PGE and other mineralization at the Company's southern Labrador Trough properties, geological, and geometrical analyses of the southern Labrador Trough properties and comparisons of the properties to known Cu-Ni-PGE deposits, and other expectations, plans, goals, objectives, assumptions, information or statements about future events, conditions, results of exploration or performance that may constitute forward-looking statements or information under applicable securities legislation. Such forward-looking statements or information are based on a number of assumptions, which may prove to be incorrect. Although Northern Shield believes that the expectations reflected in such forward-looking statements or information are reasonable, undue reliance should not be placed on forward‑looking statements because Northern Shield can give no assurance that such expectations will prove to be correct. Forward-looking statements or information are based on current expectations, estimates and projections that involve a number of risks and uncertainties which could cause actual results to differ materially from those anticipated by Northern Shield and described in the forward‑looking statements or information. These risks and uncertainties include, but are not limited to, risks associated with geological, geometrical and geophysical interpretation and analysis, the ability of Northern Shield to obtain financing, equipment, supplies and qualified personnel necessary to carry on exploration and the general risks and uncertainties involved in mineral exploration and analysis. SOURCE Northern Shield Resources Inc.